The f40 campaign group was launched more than 20 years ago with the central aim of influencing significant change in the way Government allocates funding to local authorities and schools. The group is made up of 42 local authorities who are among the lowest funded for education in England. f40 seeks fairness and equal opportunities in education for all children, regardless of where they live, and wishes to see schools properly funded and equipped to enable them to provide a quality education to meet the future needs of Britain. Under the current system, schools are not funded equitably. We recognise that those schools with pupils with higher additional needs should receive more funding, but the way this is applied across the country is inconsistent and unfair. Historically some schools are getting additional funding through a range of add-ons and protections and we believe that this is fundamentally wrong. All schools should receive the same core funding to allow them to operate successfully and to offer the best education possible to their pupils. 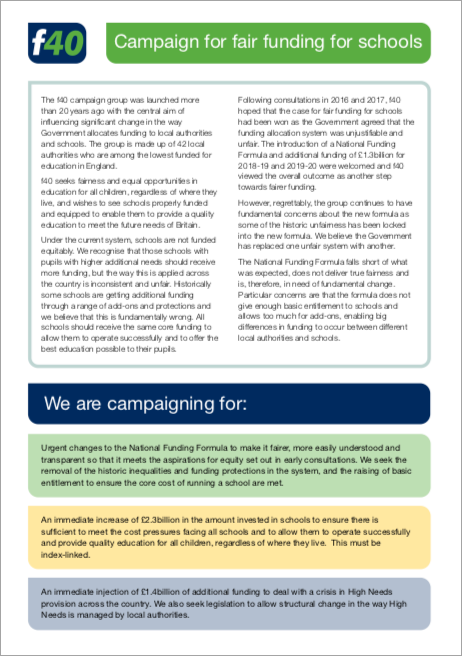 Following consultations in 2016 and 2017, f40 hoped that the case for fair funding for schools had been won as the Government agreed that the funding allocation system was unjustifiable and unfair. The introduction of a National Funding Formula and additional funding of £1.3billion for 2018-19 and 2019-20 were welcomed and f40 viewed the overall outcome as another step towards fairer funding. However, regrettably, the group continues to have fundamental concerns about the new formula as some of the historic unfairness has been locked into the new formula. We believe the Government has replaced one unfair system with another. The National Funding Formula falls short of what was expected, does not deliver true fairness and is, therefore, in need of fundamental change. Particular concerns are that the formula does not give enough basic entitlement to schools and allows too much for add-ons, enabling big differences in funding to occur between different local authorities and schools. Urgent changes to the National Funding Formula to make it fairer, more easily understood and transparent so that it meets the aspirations for equity set out in early consultations. We seek the removal of the historic inequalities and funding protections in the system, and the raising of basic entitlement to ensure the core cost of running a school are met. An immediate increase of £2.3billion in the amount invested in schools to ensure there is sufficient to meet the cost pressures facing all schools and to allow them to operate successfully and provide quality education for all children, regardless of where they live. This must be index-linked. An immediate injection of £1.4billion of additional funding to deal with a crisis in High Needs provision across the country. We also seek legislation to allow structural change in the way High Needs is managed by local authorities.